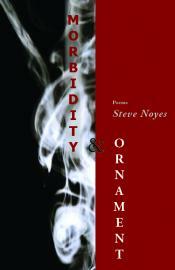 In his fourth book of poetry, Morbidity and Ornament, Steve Noyes departs from a previous preoccupation with the narrative sequence that he mined in Ghost Country to explore a range of styles and subjects: basketball, Islam, the dissonance and resonance of Chinese culture, the mating habits of slugs, the first year of marriage in a new house, ciagerette smoking and love poems that animals, strangely, inhabit. There are Petrarchan sonnets, poems in mock-Chaucerian middle English, a couple of surreal, winding, anxiety dreams, and a remarkable sequence that intersperses lyrics with homages to the Tang and Song dynasty poets, in Chinese and English. The book is a cornucopia that defies thematic arrangement. As usual, Noyes’ tone migrates as much as he has during his life: it is belligerent, sarcastic, reverent, matter-of-fact, poignant and often acerbically funny. The voices vary so much that the effect is of listening in on life itself and its many personages: the assassinated Filipino leader Aquino, a Chinese fairy with a flute, NBA star Allan Iverson riffing on a Keats poem, a marooned quasi-prophet in an airport, a civil servant who may be from our time or the 9th century. Readers will recognize the recurrence of one of Noyes’s familiar themes, the drift and dissolve of cultures and civilizations across time and space, but will find a new emphasis on the family, faith, and humour, the necessity of finding new music in an old instrument, the human voice. This collection is testament to Al Purdy’s earlier observation that Noyes is “a damn good poet”.